There are three different types of heavy duty can openers that we are going to review on this site and they are heavy duty electric can openers, manual can openers and table mounted can openers. Although the main purpose it to open cans, many of the home-use can openers come with features such as bottle openers and a knife sharpening unit. – Once you engage the can opener, you do not need to hold the can while it is working. – You only need to give it slight pressure on the lever to keep it going, so it is great for those with arthritis. – Can open wide mouth cans as well as smaller cans. – Like most can openers, it does not work on “pull-tab” cans. With Edlund, we’re talking high end commercial electric can openers. These units are expensive and are not designed for home use but for commercial purposes. If you need quality, reliability and speed then Edlund is an investment you should consider. 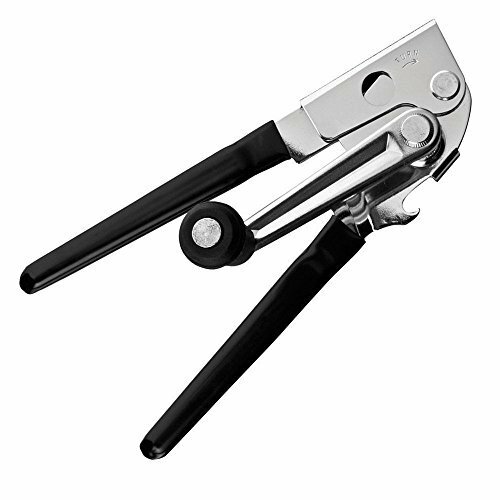 If you are looking for small, portable manual can openers for home, here are a few that have great ratings. All of them have a non-slip grip and easy glide gears. If you are opening a lot of cans on a daily basis, I would highly recommend a table mounted can opener. They are fast, easy to use and get the job done quickly. When you have a lot of cans that you need to open, then this is the best type of can opener to get. Table mounted can openers are designed for volume, have a really, really sharp blade and will open thousands of cans before you will need to change the blade. Top brands for top mounted can openers are Edlund and Chefland. Although there are other brands on the market, these two shine above the rest. You install it by screwing it to a table or counter. Simple and easy to do. You will find that restaurants, coffee shops, churches and organized camps use the table mounted can openers the most. These industrial can openers are great for large cans. Here are few other options for you other than Edlund and Chefland…. The Edlund commercial electric table top can opener is designed for the restaurant or kitchen that opens 4-7 can per minute and up to 50 cans daily. If you’re looking for the best-selling and most popular can openers (in general), check this page on Amazon (updated daily). Have Lots of Empty Cans? Here’s an Idea!